We’ve finished our fourth day of seating already and the stories abound. God has been so present among us, and even though I know He is never far away, I am always amazed by the powerful presence I feel when on these mission trips. It is also amazing to me the way He equips His people to do His work in the world. All of these people come together from many places and between us we have all we need to do what is set before us. What one does not have in skills or physical resources, another does and offers it freely to the team to achieve the task at hand. The spirit of community and unity in this team is a beautiful thing to witness first hand and I am blessed and humbled to work alongside each one. We have had the privilege to serve some amazing people over the past few days. 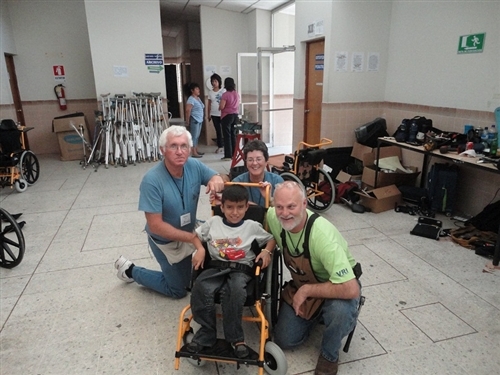 So far we have fitted and distributed approximately 150 wheelchairs and many more walkers, canes, and crutches. We have had nearly 80 commitments to Christ during this time as well, and many more recommitments. I would like to tell you just a few stories of these past few days. Christopher is a beautiful young man of 15 who is approximately the size of a 3-year-old. He has a diagnosis of Osteogenesis Imperfecta, which is commonly called brittle bone disease. With this condition, it is very easy for bones to be broken from even common activities such as being lifted up or getting dressed. He has probably had several hundred broken bones during his 15 years. 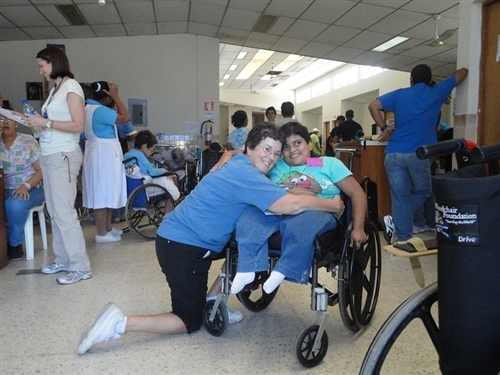 He has a very gentle spirit and an infectious smile.When we evaluated him, we knew that we would have to find a wheelchair that had a very cushioned seating system in it to help protect him as much as possible. One of the other therapists and I went “shopping” in our supply of wheelchairs to see if we could find a chair that would be safe for him to use. As we looked there was no perfect chair for him, but if we took a cushion off one chair and turned it sideways in another chair it might work. We found a special cushion called a roho which is filled with pockets of air that is used to provide pressure relief and it was exactly the right size if we turned it sideways. The chair that could work needed a solid platform added under the cushion and we got one of the men started on cutting and smoothing that. Next came the need for a padded seatbelt that would not hurt him by using it. We hunted around and found a nice padded one and that was added to the chair as well. I asked Christopher for a favor. I told him that I needed him to help me teach others about good wheelchair seating and how to help other people. He could do that by letting me take pictures of his arms and legs to teach others about osteogenesis imperfecta. He flashed me that smile of his and started to roll up us shirt sleeve and pant legs. He also told us that his goal in life is to become a missionary. He is truly an amazing young man. I will attach a photo of him for you see. As I try to choose just one more story to share with you today, I am hard pressed to decide as there have been so many who have touched my life in a special way. 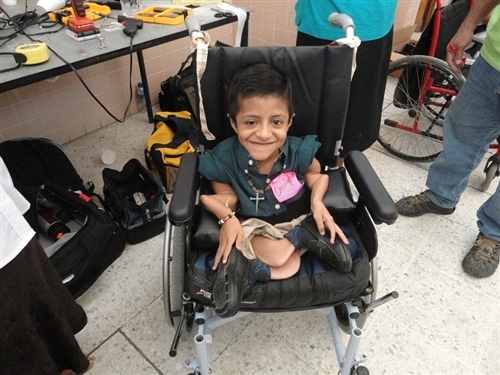 There was 19-year-old Alajendra who part way through her wheelchair fitting, just spontaneously threw her arms around me and gave me a hug…and then there is 11-year-old Mauricio who got his first wheelchair that he could propel himself and was just so elated when he was finally able to move with ease for the first time in his life…and William who recently had a brain injury and is now profoundly disabled. Each one a story in its own right. There are just too many to choose from and the time is getting late. So I will close and just attach some pictures I hope will tell the stories in some way themselves. Please continue to pray for this entire team. We still have 200 or more chairs to distribute and many more persons with whom to offer the best gift of all, the love and person of Jesus.